Taste test: This mix consists of Cruncheez, Barbecue Ringolos, Barbecue Corn Chips, Nacho Tortilla Chips and Pretzel Twists. This is a decent party mix, but nothing spectacular. 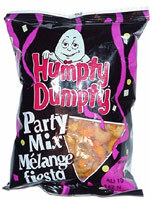 The inclusion of Humpty Dumpty's Cruncheez was a definite plus. I'm usually a critic of including pretzels in a party mix, but in this case I think the pretzels were a positive contributor. However, everything else in here — Barbecue Corn Chips, Nacho Tortilla Chips and Barbecue Ringolos — just seemed like a jumble of flavors, with the flat-tasting, potatoey Ringolos in particular just not fitting anywhere in this combination of snacks. Smell test: You can mainly smell the Ringolos and cheese curls. 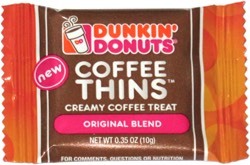 Trivia: The ingredients, listed in French and English, fill up almost half of the back of the bag, even in small type.